You want a little fun in your sci fi? Of course you do. Who doesn’t. And here we have a whole planet full of dead bodies. What could be more fun than that? he was the lone inhabitant in the food court structure built to hold at least a thousand people, with a visitor center, souvenir and snack shops, several mausoleum levels, a nondenominational temple, a space elevator, and vacuum tube train lines circumnavigating the planet. Here’s the deal. With billions on Earth dying, where oh where can we put them? Stack them up like firewood? No. Of course not. Now if it were me running the show, I would have required cremation for all, damn the pollution from the burning, but no, this bunch decides that shouldering the expense of building a high tech funeral parlor on some far away planet is the way to go. Mourners by the hundreds used to flock to the planet to pay their respects. Heck, they had holographic displays wherein the deceased would appear at the grave with a message for the loved ones. How cool is that? But almost no one came anymore. Not for 50 years or so. So DeepSix, the holding company, now had only one caretaker a tour, each tour lasting a year. Harvey Crane was bored. He was not bothered by the isolation or being the only one there, well the only live one there. He played video games and generally was able to amuse himself pretty well. But he got this idea to upgrade an AI with all kinds of features so it was like having a companion. Who seemed to be getting smarter and smarter, and more and more independent. One evening, Harvey gets a signal from the security system that something is amiss in a far section. So he gets on the train and after quite some time, arrives at the trouble spot, to see a hologram playing. What the deuce? You have to push a button to start them up. And there is no sentient life on this planet, except him. He asks the system computer to scan for sentient life. Nada. Scan for any movement. Nada again. Hmmm, thought Harvey. In all the time he has been on duty, there has never been an incident. OK, maybe the mechanism is on the fritz, seeing how this place is centuries old. He, being a mechanic, checks it all over, can’t find anything wrong, shrugs his shoulders and goes back to his station and the chess game with his AI. A few days later, another trouble signal shows. This time to a really far away section, one to which Harvey has to take the planet train. Again, no sign of any problems, except for the hologram playing in which the deceased is ranting about how his heirs are going to receive NOTHING, NOTHING. hahaha. I bet you are dying to know what is going on, right? (See what I did there?) Well, I am not going to tell you, but rest in peace knowing (I did it again. I can’t help myself) that it is a doozy. 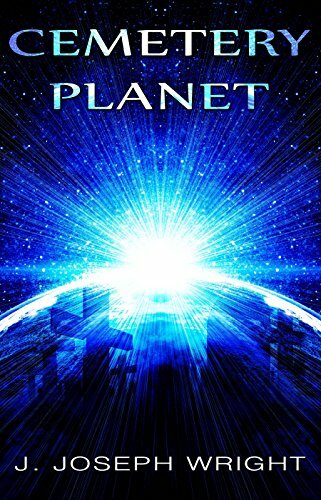 One thing I like about sci if and speculative fiction are the creative and unusual ideas, and a planet that serves solely as a burial ground is certainly interesting, you must admit. This is the seventh in an interminable mysteries series starring the affable Sheriff Ray Elkins, up in the Upper Peninsula of Michigan. I know I have read at least one other book in this series, but maybe it was before I started the blog, because it isn’t in the archives. I looked over his titles, but they all look familiar. The sheriff is a kayaker and in the other book I read, met a nice lady doctor living near the lake and who also kayaks. You know, talk about your luck, right? 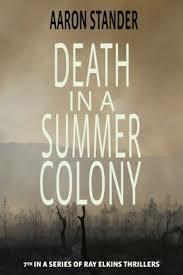 In this book, Ray is called to a private colony on the lake for a screwball holing up in one of the empty cottages in the colony and who eventually conveniently ends the standoff by blowing himself up. That is when Ray becomes acquainted with the colony and its resident manager. He also meets the colony’s most annoying personage, a wealthy man who is bossy beyond belief and annoying as aich ee double hockey sticks. He no longer lives in the colony but has built a huge house on the adjacent cliff. He stays involved in the colony affairs because he provides a not of money to keep things running. The colony every year puts on a play in their rattletrap theater, this time it is Agatha Christie’s Murder at the Vicarage, which entails Scene Two opening on a man slumped on his desk, dead. The annoying guy wants to be involved in the play, but this year has no time to learn lines, so asks for the part of the dead guy. Everyone thinks that is funny…. until the night of the play and he is found actually and truly dead slumped onto the desk, ready for the curtain to open. So the mystery is a classic, with lots of suspects because NOBODY liked the guy, and some had lost retirement money which was invested with his company, and there is an ex-wife living in the colony and who had a part in the play, his daughter-in-law who was also his lawyer, an alcoholic current wife, a son, some employees, you know, the usual suspects. It ended with the Christie trope of all the suspects gathered in a room, (but not called together by the Sheriff but there in order to plan the funeral), and rather than the conversation being centered on funeral arrangements became a party of who shot John accusations, with the guilty person suddenly pulling out a gun…… sigh. I was really disappointed in this ending. Frankly, I didn’t even bother trying to figure out who done it, because the whole thing was just a canned version of every other mystery you have ever read. I guess by the time to get to the seventh in a series, you can just phone it in. 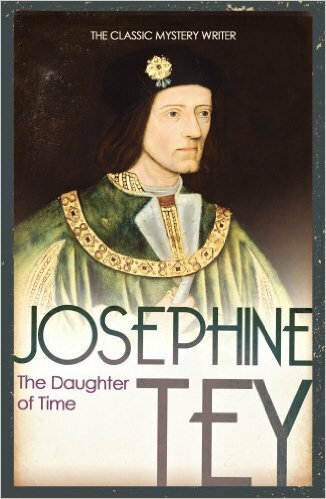 Josephine Tey was one of two pseudonyms used by Elizabeth Mackintosh, a Scottish author best known for her mystery novels which feature Inspector Grant of Scotland Yard, and her play, Richard of Bordeaux. This is not a mystery novel exactly, even though it does feature Inspector Grant. He is laid up in hospital in this 1951 novel, with nuttin’ to do. 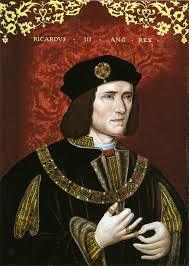 A friend brings him a collection of portraits for his amusement, and he is quite taken with that of Richard III. I thought this might be an interesting read for me, seeing as how His Majesty has gotten so much press lately, what with being buried under a parking lot, and all that followed from that. Inspector Grant, while giving the king’s portrait a really good look, can’t decide whether he looks like a judge or a murderer, and remembers that the king was accused of murdering or having someone else do the deed, of his two young nephews, supposedly because they were in his way to succession to the throne. Grant gets interested in this and wonders how the story came to be and was it in fact true. It seems to be based entirely on Sir. Thomas More’s account, which upon some savvy detective work, turned out to be based on the account by John Morton, Henry VII’s Archibishop of Canterbury. Yeah, THAT John Morton. Morton hated Richard. It is on this account that Shakespeare fashioned his character in his play, Richard III. A young man who is doing research on another time of history is sent to Grant to help him out and becomes his happily willing research assistant. As the research goes on and gets deeper and deeper, it becomes clear that all this history that everyone believes is all hogwash and not what happened at all. It is Tey’s way of examining how history is constructed, and how certain version of events come to be widely accepted as the truth, despite a lack of evidence. Her tragedy was that she was born a Queen with the outlook of a suburban housewife. And at the very end of the book, the researcher finds out that unknown to him (and Grant), historians have known for yonks that the story about Richard was a bunch of hooey, but that the correct version had not yet made its way into the history books. So we have this whole book used as a vehicle to talk about the history of Richard III. Yawn. Did you know that over 600,000 people died in the American Civil War? Demographic historian David Hacker now says there were 750,000 casualties. This is probably more accurate. The book was written in 1982 and Hacker’s analysis is much more recent. There were more or less over 300,000 lost on each side. 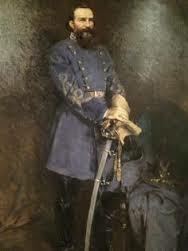 But the difference was that the Confederacy lost one out of every 19 men, whereas the Union lost one out of over 3,000. The South was almost annihilated, its cities destroyed, its railroads, its farms and fields despoiled. the shortsightedness of a region going to war while hopelessly incapable of sustaining itself in a long and devastating struggle, or with the enormously human and spiritual loss of approximately 300,000 young men, or with the all but incalculable loss of property and momentum in advancing the region beyond its undeveloped frontier conditions. Historians themselves have been caught up in what the authors intriguingly call the “Lost Cause” mentality. Connelly and Bellows compassionately yet clear-sightedly examine with interest the mind and the culture that made the war possible, and in its aftermath, what is called The Lost Cause. An antebellum South embroiled in a power struggle with the “churlish Saxons” of Yankeedom could identify with a heroic Ivanhoe. 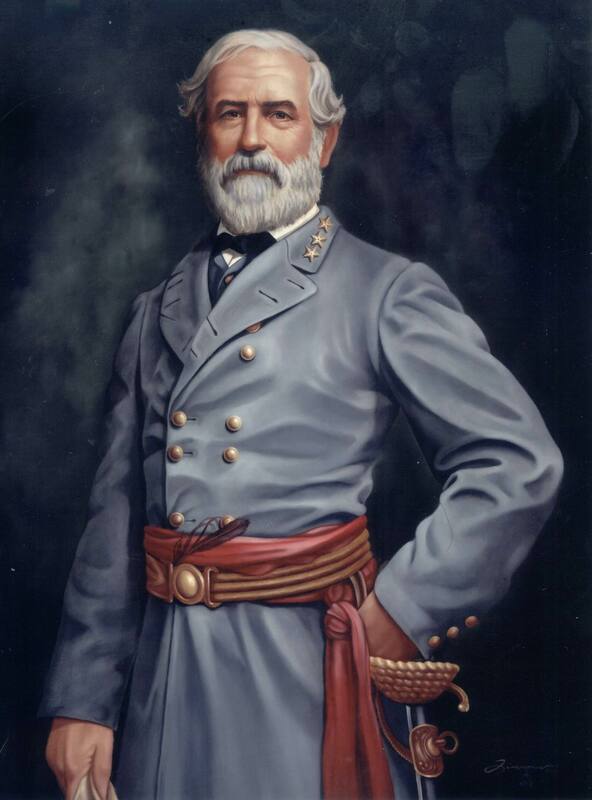 Small wonder it was that the Rebel battleflag adopted the design of the Scottish St. Andrew’s cross, or that Dixie writers during the Reconstruction era attempted to link the ancestry of Robert E. Lee with that of Robert the Bruce. The Lost Cause phrase developed soon after Appomattox as a byword for the perpetuation of the the Confederate ideal. I found this extremely interesting, being a Yankee myself. The book’s main author is a southern gentlemen, a professor at University of South Carolina, so it is not a condescending, superior look at the conquered by the victor. Connelly is a historian specializing in Civil War issues and personages of that time. those eternal southern opposites, such as a longing for order and a penchant for evasion of the law, deeply embedded religious fundamentalism and hedonistic behavior, Dixie braggadocio and insecurity. The religion of the Lost Cause generation was man-centered. The southern concept of the Trinity was not the Father, Son, and Holy Spirit, but God, man, and Satan. the cultural isolation of the Old South allowed the populace to exist within a fantasy world of utter contempt for the Yankee and absolute confidence in southern might. The antebellum South remained the most puritan of all American regions, and was an exaggeration of that general American faith that there is a correlation between Jehovah’s grace and success. The belief that God was on the side of the Confederacy was universal south of the Potomac. 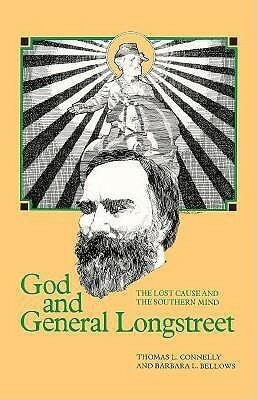 The title of the book comes from the deification of General Robert E. Lee at the expense of General James Longstreet, whom Lee called ‘his old War Horse’. He was at odds with Lee about the strategies and tactics at the Battle of Gettysburg, and his detractors pilloried him claiming he was the reason for the Confederate loss at that battle. Perhaps no Confederate officer is surrounded by more controversy than Longstreet. He was Lee’s trusted advisor and friend. But, after the war, Longstreet became the target of many “Lost Cause” attacks. His letters to the New Orleans Times, his support of the Republican Party, and his memoirs served to alienate many Southerners. The book talks about how ‘Virginia Won The War’, the state’s role in the conflict and its image-building of reluctant virgin, if you will, being against secession, but being a slave state, forced into the war. Of course, there is so, so much more in the book, and if you have in interest in such things, I urge you to read it. Beautifully researched, it is a fascinating read, and I would be interested to know how southern readers feel about the conclusions in it. Carolyn Jourdan wrote two other books that I really enjoyed, Medicine Men – Extreme Appalacian Doctoring, which I discussed here, and Out On A Limb – A Smokey Mountain Mystery, which I talked about here. So I was expecting more great stuff with this book. Sadly, not to be. Not much of a mystery, the characters too cutesy, the book too preachy and sermonizing, the plot just not credible, and although the catch line is A Paranormal Mystery, not so paranormal. This was written in 1980, in a stylized combination of fantasy, stream of consciousness, reminiscences, and goodness only knows what else. It has been called wonderful by some, impenetrable by other, political by yet others. I’ll go with that. But let me warn you right off, if you come for the story line, there is a whole lot of thicket to wade through to keep it in sight. It goes from present, to past, to total fantasy. And you know me, I am all about the story. I hate having to keep chasing it down. Basically, it is about a community of healers in some little unnamed town in the south, in Georgia, and a community of civil rights activists. Velma Henry has tried to commit suicide, and it seems not for the first time. She has been a civil rights activist and a worker for women’s rights, and it has all been overwhelming. Minnie Ransom is a powerful healer with spiritual powers, and a spirit muse/mentor, Old Wife, with whom she has pages long philosophical conversations. 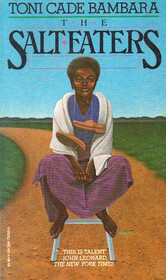 The book opens in the Southwest Community Infirmary with Velma seated on a stool wearing only a hospital gown, and Minnie across from her trying to determine whether Velma is in a place in her head that is ready to be healed. From there we get Velma’s thoughts and reminiscences, back to the present with the healer, then into the healer’s mind, then back to present, then a circle of 12 people arrive to form a healing circle, but one of them leaves, a woman important in Velma’s life, and then we get all the back story to this woman through her thoughts, then back to present, then Velma again, with memories of her husband from whom she is now estranged, and from that we get into the husband’s head, and his perspective on Velma, then back to present, then pages of the healer chatting with Old Wife. 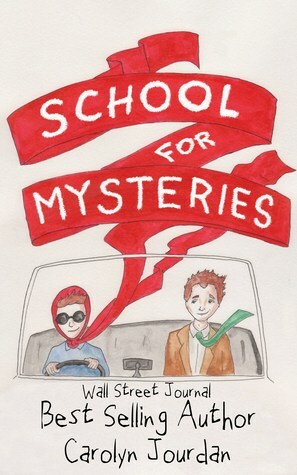 I so wanted to love this book, a recommendation from somewhere. The book received the American Book Award. 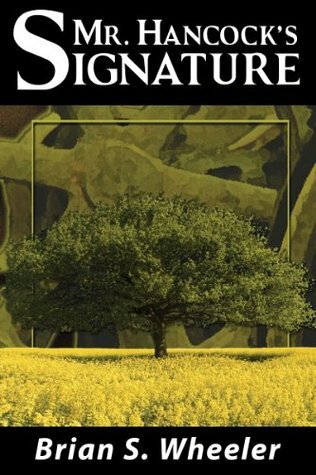 It is considered experimental writing, and is poetic and meditative in tone and style. No one character is truly the protagonist here, as the focus gradually builds to center on the community of activists and healers, all people spiritually struggling and looking for grounding. So I didn’t love this book. It is a difficult book to read, to follow. There is not so much a plot as an arc. I prefer my stories a smidge more linear because I am old and don’t want to work all that hard on a story that focuses on the political and civil rights struggles of the 60s, and 70s. It is heavily political, and maybe it is the surreal political season we are living through right now, but I want to read something less political so I can forget just how horrible, paranoid, racist, bigoted, homophobic, and xenophobic a great deal of the American citizenry can be. Yes, I accept it. I am a pitiful excuse for a human being. But the thing is, Gentle Readers, that the book reflects Real Life so much more than the more traditional method of story telling. It goes hither and thither, from present to the past, from fractured memory to actual events. Our lives don’t really move along in a linear fashion. Our days are full of remembering the past, trying to predict the future, trying to organize the day we are in. Maybe that is why this book was a challenge. Know what I mean? I figured that would get your attention. I know some of you really like a good ghost story, and this one is a doozy. You know how so many ghost stories are about evil spirits, and malevolent creatures. Not really my cup of tea. I keep asking myself, why does everyone always envision evil in the afterlife? But this story has just the best collection of ghostly stuff. You will totally love it. There is a golem, and a dead body, and water spirits, and almost best of all, a ghost train! Allow me to explain. It begins with the Hancocks, a farming family in the rural environs of a small town in the plains, the flatland, of Illinois. I’ve been out there. Boy, is it flat. Miles of that flatness. Well, the Hancocks, the last of them, is selling out, lock, stock and barrel, at auction. Mr. Dunning, a hard-nosed businessman of a farmer, has spent his time and money gobbling up failed farms and their equipment. At the Hancock auction, Mr. Dunning offers to buy Hancock’s land, which contains the family cemetery, containing several generations of Hancocks. The last remaining Hancock agrees, as long as Mr. Dunning maintains the cemetery, and permits no further burials in it. Dunning agrees to the deal, all is sold, and Hancock disappears, went wandering, and is never heard from again. Mr. Hancock had a brother, dearly loved, who was killed in the war. I am fuzzy as to which war. His vehicle is blown up, and there are no remains to return to the family, but they do receive a box which contains his medals. They obtain a black obelisk, which they erect in the center of the cemetery and bury the box in front of it. Years later, the cemetery forgotten and abandoned, young Ian and friend ride their bikes out to see it, a kind of teen boy rite of passage in the area. Ian sees the obelisk glowing red, and hears a humming, or thrumming, and he touches the stone and is overcome with a …. I don’t know what. He is overcome. Being the son of a military man, the father is stationed elsewhere and Ian soon after has to leave the town. Fast forward to Ian as an adult, come back to the one town he felt was a little like home, hired to help the town rise out of its doldrums and try to rejuvenate it by attracting businesses to the place. I know, you are asking about when the ghosts and golem will appear. I am getting to that. Have a little patience. First we have to talk about the abandoned train trestle, which the kids jump from in rites of courage, etc. Occasionally, the hidden rocks in the river claim a jumper. And now we come to our first ghosts. (I know. You’re saying, “It’s about time, woman. Get on with it.) These are wispy spirits of the dead in the river, the accidental deaths, the kids who hit a rock, the suicides, and a few murders. And these spirits haunt and taunt Minister Jackstone, a former town drunk, now on the wagon, with a congregation that loves firearms. He wears a couple of antique guns on his hips because he has made a deal with the river. He will try to keep their memories alive if they stop haunting him. At times when they come back, he goes back to the bottle. And now the ghost train. I sooooooo loved this ghost train. It has a conductor with a pocket watch that tracks the hours of the universe, and goes all wonky when earthly activities are awry. It has imps piling in the coal to make it hotter than hot so that the train can make a specific curve that will bring it into this dimension, where it arrives at the old depot, no longer used as a depot, but is a warehouse. The night watchman feels the ghost train, sees the oncoming headlight of the huge monster, sees it stop, then leave the station. What is left behind is a box, coffin sized. The sheriff is called, and the box is found to contain a body. It turns out to be the body of the last Hancock. The local mortician takes it to prepare it for burial, but where to bury him is the question. Ian feels he should be buried out in the family plot, the sheriff thinks the public cemetery in town should be the place. There is where the golem enters the picture. He is a sewn together creature, with a bad leg, and secretly comes to town. The next morning after the arrival of the body, the body is found on the front steps of the local B&B. How it got there out of the mortician’s locked basement work area is a mystery. The body is taken back to the mortuary, and the following day is found in the old movie house, no longer in use. The following day it is found up top on an abandoned smoke stack. There is so much more wonderfulness to this story, but really, I hate making a spoiler out of it, so I will stop here, because I have given you the ghosts, the golem and the ghost train as promised. If you like ghost stories, paranormal, that kind of thing, do read this. You won’t be sorry. OK, field notes. The golem is not strictly a golem. A true golem is made of clay, or earth, and a spell put on it by its maker which brings it alive and if must do the bidding of its maker. It is old Jewish lore. This figure in our story is more a self-created Frankensteinish creature, having sewn himself together to accomplish this one mission. The ghost train comes back two more times. For a reason. The book was first published in 2008, and the e-version I have is riddled with editing problems –typos, missing words, homophones, stuff like that. Enough to be slightly annoying but not enough to make it unreadable. I would assume that a current version will have been thoroughly cleaned up by now. I believe there is now a sequel, but for me, this was so perfect in and of itself that stretching it out any further would totally ruin it for me, no sequel for me. Loved it. Go read it.